Faced with questions about how to adapt and reuse a former industrial site in the center of town, an international insurance corporation, together with the Swiss city of Winterthur, held a competition among architecture and design firms to come up with an innovative, effective plan. 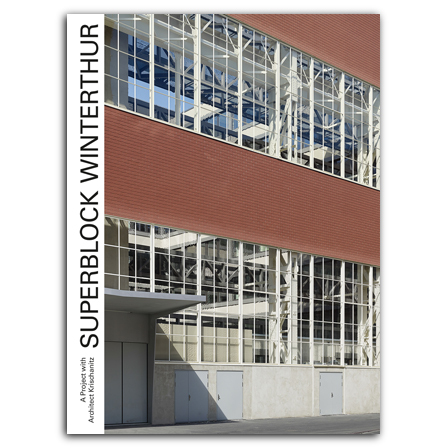 The winning firm was the Vienna-based Architect Krischanitz, and their submission, Superblock, is a striking idea given a brilliant execution: it combines a large workshop where diesel engines were assembled with newly constructed yet visually complementary buildings. This book details the project from concept to completion, using numerous photographs, plans, and visualizations to trace the history of the site, the genesis and development of the Superblock concept, and the revitalization of the neighborhood that it is expected to lead. , born 1950, studied architecture and did a PhD in economic history at ETH Zürich. He lives and works as a freelance publicist and researcher on industrial culture and heritage in Winterthur. , born 1946, studied architecture at Vienna University of Technology. He was a co-founder of Missing Link architectural cooperative in 1970 and established his own firm in Vienna in 1979. He hast taught at Technische Universität München 1988–89 and as a Professor for Design and Urban Regeneration at University of the Arts Berlin 1992–2011.